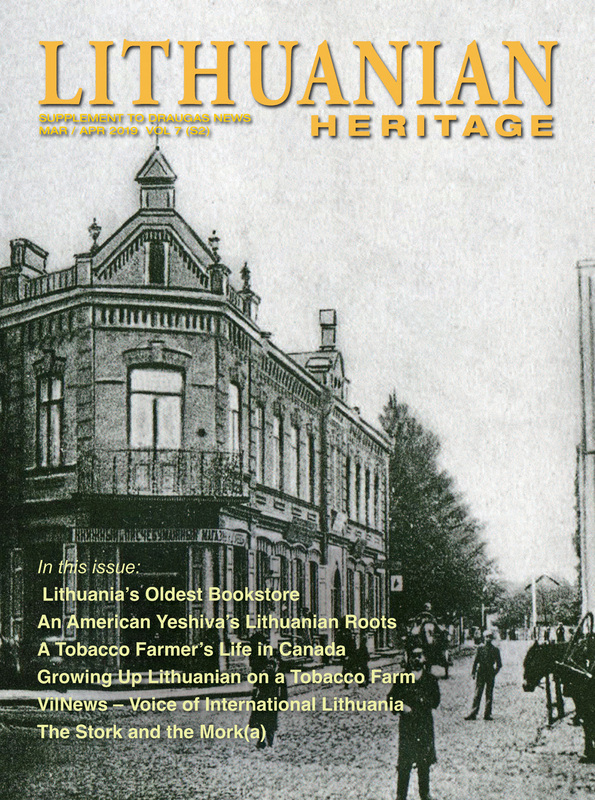 When one considers Lithuanian American communities in the United States, ethnic enclaves in cities such as Chicago, New York and Boston come to mind. I too can claim part of my heritage from Chicago, since that is where my mother grew up and where all of my ancestors first stopped when they came to America. However, not all families settled in urban areas; my guess is that many longed for the rural environment they left behind in their homelands. As a result some mustered the courage to put down their roots in more fertile soils of the US. One such couple was my grandparents, Staini and Maryte Lankutis. In 1909, Grandpa’s brother Paul (Povilas) joined him in Chicago. Right about that time, the Milwaukee Railroad wanted to encourage homesteading and mining out west. Finding young men with a sense of adventure wasn’t difficult, given the large number of immigrants in the US at the time. 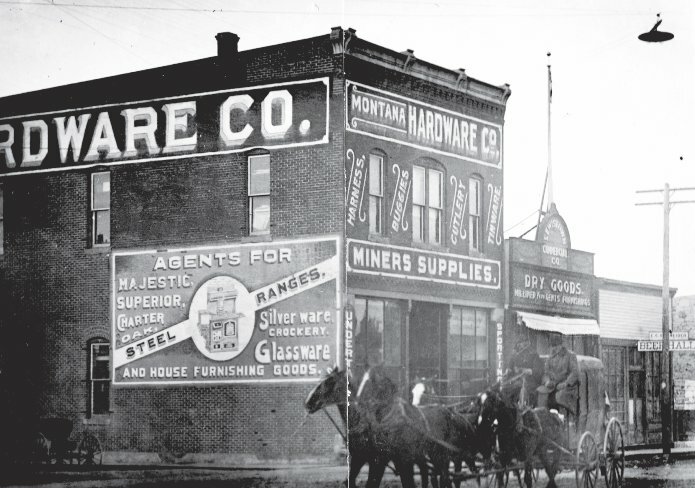 The railroad distributed brightly colored handbills encouraging settlers to Montana, showing a farmer behind a plow and dollar coins leaping out of the furrows. Who could resist? After all, would you want to spend your life as a wage slave in the stink and grime of the stockyards, or seek your fortune under the Big Sky? Grandpa and Uncle Paul hopped a train to Montana. They joined their cousins, George and Paul Celedinas, working in the Klein #2 coal mine just south of Roundup. Sadly, in December 1911, Uncle Paul passed away from cystitis at the age of 32. He had only been in America for two years. After Uncle Paul died, Grandpa reconsidered working in the coal mine, where his life was at risk every day. He decided to move north to Forest Grove. Although most of the good land was already taken, in 1912, he filed on 160 acres near the Big Hill area, 10 miles southeast of Forest Grove. Grandpa returned to Roundup to purchase a horse and rode her 50 miles to the ranch. Unfortunately, the horse ran away. Grandpa took off on foot to look for her. He ended up having to walk back the 50 miles from Forest Grove to Roundup, where he found the horse with her original owner. The poor thing was homesick! He solicited all the equipment dealers in Lewistown, hoping to find someone who could extend credit to help him get started. Bill Wiedeman of Montana Hardware thought Grandpa “looked honest” and said he would extend credit to Grandpa until the fall harvest. After that, Grandpa said Mr. Wiedeman walked on water, and he was forever grateful for his kindness. Grandpa usually took his cattle to market in Chicago once a year, but this time he was going to bring back more than just his annual income. It must have been exciting to be in the big city with a handful of cash and all the pretty girls for the taking. He discovered a spirited young Lithuanian lady, ten years his junior. 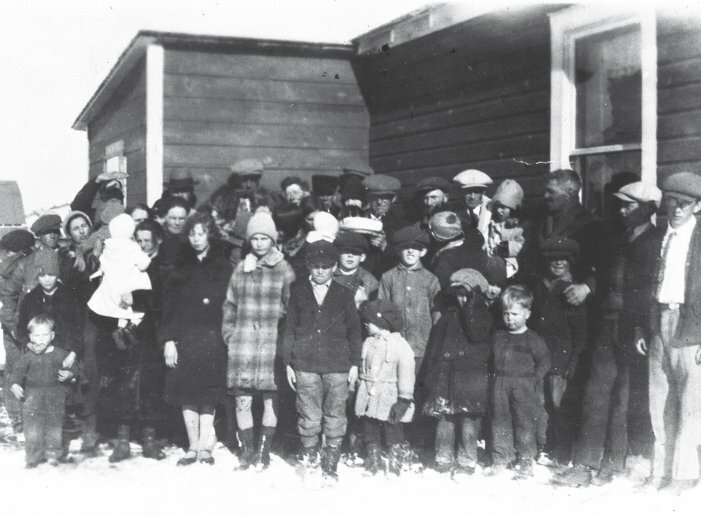 Grandpa’s Leap Year Birthday party, 1930’s. Grandma and Grandpa courted while Grandpa was in Chicago, but he soon had to return to his cattle. 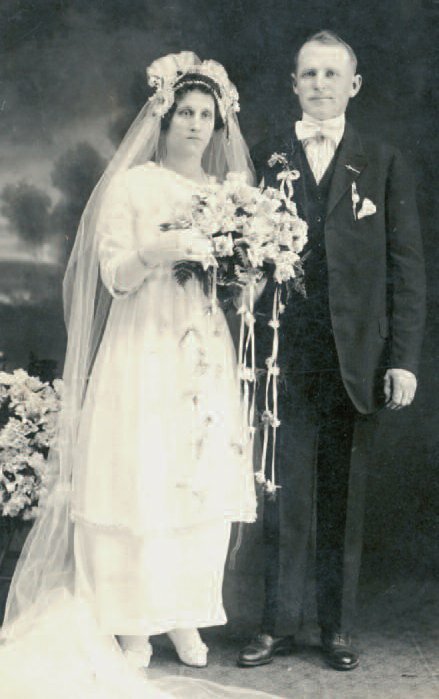 They started a pen pal relationship and in January of 1918, Grandpa traveled back to Chicago to marry his beloved Maryte at Providence of God Church. After the wedding, they took a train to Grass Range, where a friend had left a sled and a team of horses for them to travel the rest of the 15 miles to the ranch. This is where Grandpa had to answer for his vague explanation about his living conditions. When they got to the top of the hill, Grandma saw that the house was just a 14 x 16 cabin, with, you guessed it – no running water! In the beginning of 1918, she became pregnant with my father, who was born in November. This was the year of the flu epidemic, from which Grandpa almost died. To think of what Grandma went through that first year: hauling water in the dead of winter while pregnant and wondering if her husband was going to survive infuenza. Grandma didn’t know how to cook when she arrived in Montana. A neighbor, Amanda Syverson,was kind enough to teach her. Harry Syverson,Amanda’s husband, talked about how my Dad,when he was about four years old, had frightened the adults.Grandma couldn’t find her littleson anywhere. In desperation,she ran down the hill to the Syversons to ask for their help.After an intense search, they found him in the barn —he had crawled into a manger and was fast asleep ! Black Butte as viewed from behind the Lankutis house. 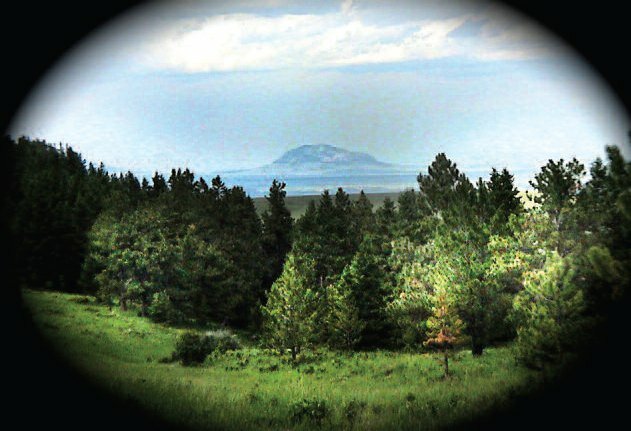 The Lewis and Clark expedition traveled on the other side of Black Butte on their way west. Grandpa was a Leap Year baby, so Grandma would throw a big party for him every four years. Technically, he celebrated his 21st birthday the year he turned 84. He said that he could now “call himself a man” because he was officially 21 years old. During the Great Depression of the 1930’s, Grandpa considered returning to Lithuania instead of trying to keep the ranch going during tough economic times. Grandma told him, he would have to go back by himself because she would never again work as a field hand, as she did in her youth. Ironically, Grandma, my father, and my uncle were the only field hands Grandpa could afford during the years of the Depression. After World War II, Grandpa started hiring neighbors’ kids to come work for him. 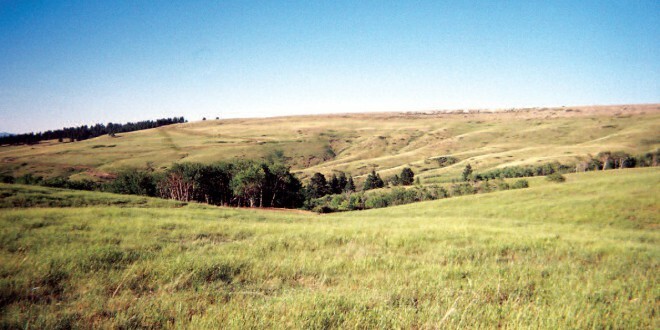 I remember Floyd Damschen always saying that my Grandpa paid the best of all the local landowners. It was this early version of the “pay it forward“ concept that has always been instilled in my family. Grandpa probably remembered the horrible working conditions of the stockyards and the coal mines, and wanted to make sure others would not suffer the way he did. Many family events took place at Uncle George Celedinas’ house in Klein, just south of Roundup. In the early days, Grandma and Grandpa would take a two-day trip via horse and wagon. They would spend their first night in an abandoned homestead and Dad would have to sleep on the hay in a manger. In the later years, we would all drive down when various members of the family came to visit. The house is still located along the highway, with the bunkhouse and outbuildings still intact. A funny story that has always been told about my grandfather was his challenge in dealing with cars. He was of the horse and buggy generation that were mortal enemies with technology. The flat tires on the “Model T” and “coming home on the rim” the last few miles were because Grandpa got tired of fixing flats or simply ran out of patching. The drop center rims on the ’29 Chevy that he could not get to fasten were always a mystery. Grandpa had a temper, and consequently most of the rims bore many hammer dents and were sprung out of shape, so they had a distinctive squeak going down Main Street in Lewistown. My uncle recalled what a sight it was to see Grandpa squeaking down the street in his truck, with a pig carcass hanging from a hook in the back. My uncle also remembers all the gates that Grandpa had to fix because “the damn things wouldn’t whoa.” The sun would hit Grandpa in the eyes and cause him to run off the road into the brush below the house. It would scare Grandma to death – the truck off the road, the horn stuck, and the motor roaring as Grandpa tried to get the truck back onto the road without tipping over. One particular time they had been to an auction and had a dining table on one side of the truck and brush and trees on the other and Grandma couldn’t get out. Once the truck did get back on the road, Grandma would get out and walk the rest of the way. I’ve always wondered how many miles Grandma walked because she was upset with Grandpa. Calving Season. If a heifer (mama cow) died in birth or abandoned her calf, the calves would have to be brought inside to betaken care of. 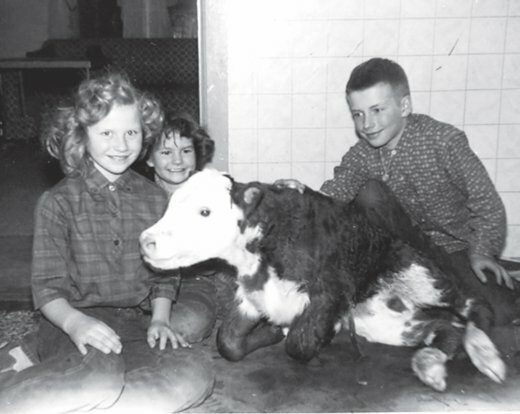 Here my older siblings are taking care of a calf. 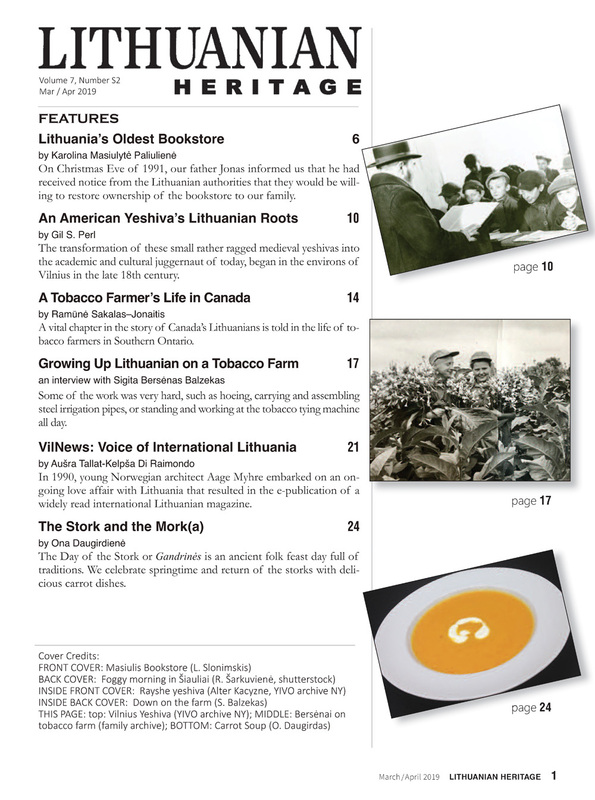 There wasn’t a lot of exposure to Lithuanian culture, since the nearest Lithuanians were Uncle George’s family in Roundup. My grandparents found it very painful to discuss anything about the country they loved, but had to leave behind. It was customary for that generation to say “we’re in America now. We do as Americans do.” Food, of course, was our cultural connection. Mom made bacon buns, and my father and Uncle Leno were up at the crack of dawn, peeling potatoes for the kugelis whenever there was a special family or community event. Next Once in a Lifetime!